A female medical student claims she was subjected to constant sexism from male medical and university staff as she trained to be a doctor. Ms Yard says she was called ‘blondie’ for a week and was warned she needed to dye her hair brunette to be taken seriously. Ms said she was constantly mistaken for a nurse and was repeatedly called ‘good girl’ when she answered questions correctly. The 24-year-old also says ward staff joked that she ‘must be here to make sandwiches’ when she arrived for the start of her placement. Ms Yard, originally from Southampton, compiled a list of the shocking examples of sexism and wrote about them on Twitter using the hashtag #everydaysexism. She wrote: ‘#everydaysexism is medicine – a thread of comments myself and my close friends have received whilst being medical students*’. One of the examples the trainee doctor tweeted was: ‘In response to answering a question ‘oh good girl’ on multiple occasions. Surprisingly never heard ‘good boy’ being used for any of my male colleagues’. 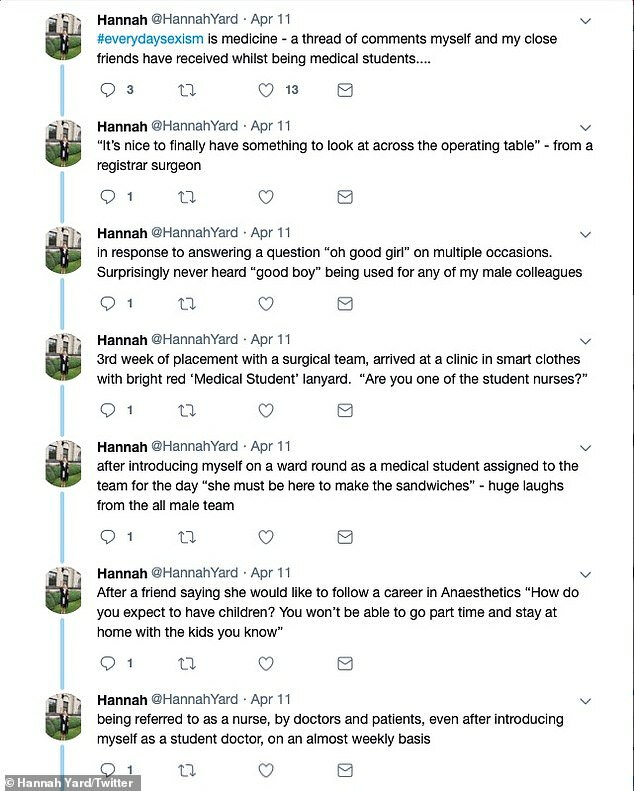 She also Tweeted: ‘After introducing myself on the ward round as a medical student assigned to the team for the day ‘she must be here to make the sandwiches’ – huge laughs from the all-male team’. ‘That made me want to cry’, Ms Yard said. Ms Yard completed an undergraduate degree in pharmacology and then chose to continue her studies at Cardiff University. 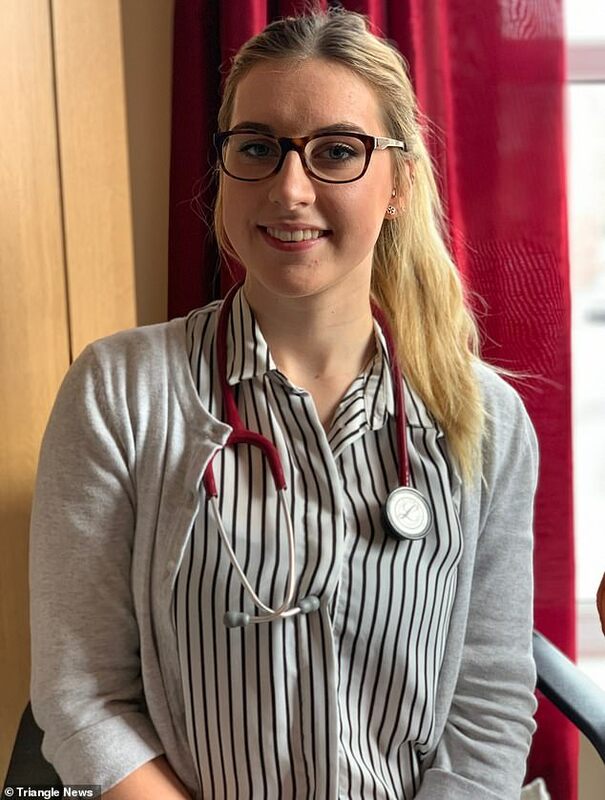 She is now in the fourth year of a postgraduate medicine course there and has been on placement in hospitals across south Wales. 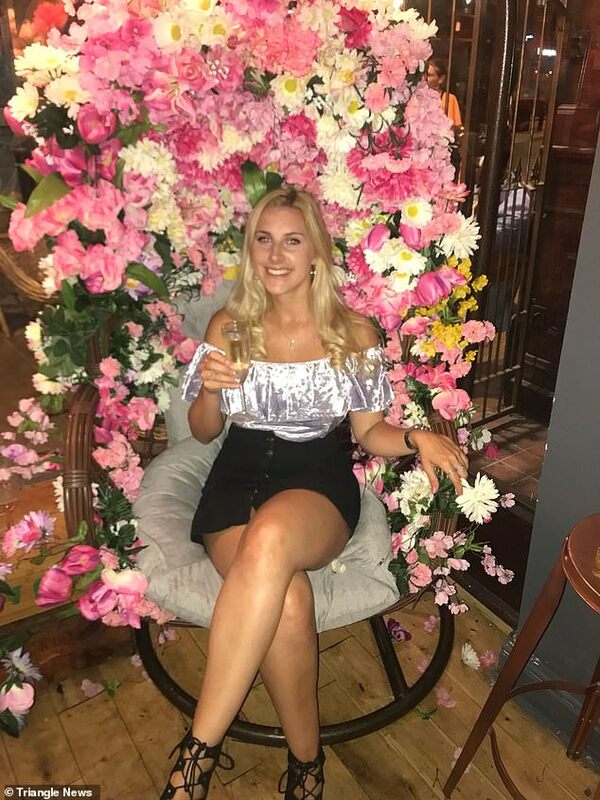 She says she was told to go brunette at an open day for a postgraduate medicine course at the University of Bristol in 2013, when she was choosing where to study. She says she was told by a member of the university’s admissions teams that she needed to make sure she ‘came across the right way’. On one occasion Ms Yard was told by a registrar surgeon that ‘It was nice to finally have something to look at across the operating table’. She felt so uncomfortable that it put her off pursuing a career in surgery. Ms Yard finished the thread by tweeting: ‘Sexism in medicine is still very much an issue, and something that shouldn’t just be accepted as ‘a joke’. The student describes herself as ‘outgoing and confident’, yet says she wouldn’t dare answer back when faced with such sexist remarks in hospitals. ‘If someone on the street spoke to me like that, I would always call them out,’ she said. But that doesn’t stop Ms Yard from being furious that she has to put up with this blatant sexism every day. ‘I’ve studied for seven years and I deserve to be here,’ she said. A spokesperson for the University of Bristol, where the hair dye comment apparently occurred, said: ‘The University of Bristol is fully committed to being a place where everyone feels safe, welcomed and respected. Adanna Anomneze-Collins, UK Medical Students Conference Chair for the British Medical Association (BMA), said: ‘All sexist or abusive behaviour is wholly unacceptable in the modern medical workplace and should not be tolerated – it is frankly unjust. ‘For medical students, being exposed to such outdated and disrespectful attitudes can have a profoundly negative effect not just on their wellbeing and mental health, but on the way they view the profession they are about to enter. ‘With women still underrepresented in medicine, we cannot allow such behaviour to deter talented female medics from pursuing careers as doctors. ‘Diversity adds to the profession and allows us to move forward as effectively as possible. ‘We should value the representation we are afforded, and harness it. Not only does discrimination harm those who are targeted by it, but it creates an environment that isn’t caring, isn’t supportive and isn’t collaborative. A Cardiff University spokesperson said: ‘We are extremely concerned by the allegations that have been made and would encourage anyone who has experienced any of these issues to raise them through our formal student complaints procedure. ‘Cardiff University is committed to supporting, developing and promoting equality and diversity in all of our activities. Our students should be treated with dignity, courtesy and respect and be free to study without discrimination. ‘We expect these high standards to be met by our medical educators whilst our students are on work placements. We also have a number of mechanisms in place within each of our partner hospitals to ensure that students have an opportunity to raise any issues they may have encountered.